One thing that always strikes me about Paris is that, like many of the larger cities in Europe, it’s flat – really flat. 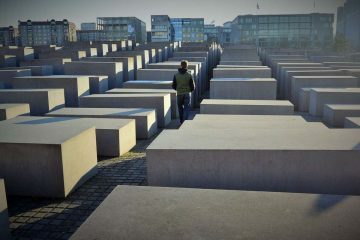 With few exceptions, most of the buildings reach a fairly uniform height, and from a distance, perspective is lost as they merge into a blanket of concrete and steel. It’s possible to climb all the tallest buildings in the city – Notre Dame, Arc de Triomphe, the Eiffel Tower – and from those vantages, the city rolls out in all directions like America’s Great Plains, the flatness broken only by the occasional distinctive outline of a solitary monument or by a knot of more modern buildings clustering like wild animals in the business district of La Défense. In this slightly surreal landscape of humanity, the highest point in Paris is crowned by the Basilica of Sacre-Coeur, one of the city’s many beloved landmarks. From the Eiffel Tower, the 130-meter hill of Montmartre and its Basilica of Sacre-Coeur are visible in the far distance (center of the photo). One of the most famous Roman Catholic churches in France, and we didn’t set foot inside. We had bigger fish to fry. Or more accurately, snails to fry. 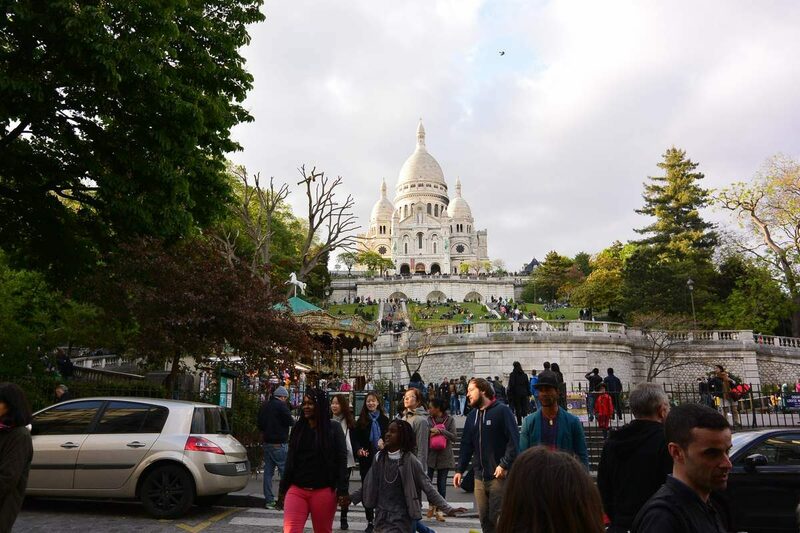 We were on the hunt for escargots – literally, “edible snails.” Climbing the steps to the top of Montmartre, the hill on which Sacre-Coeur sits, we were delighted to discover a lively farmer’s market. 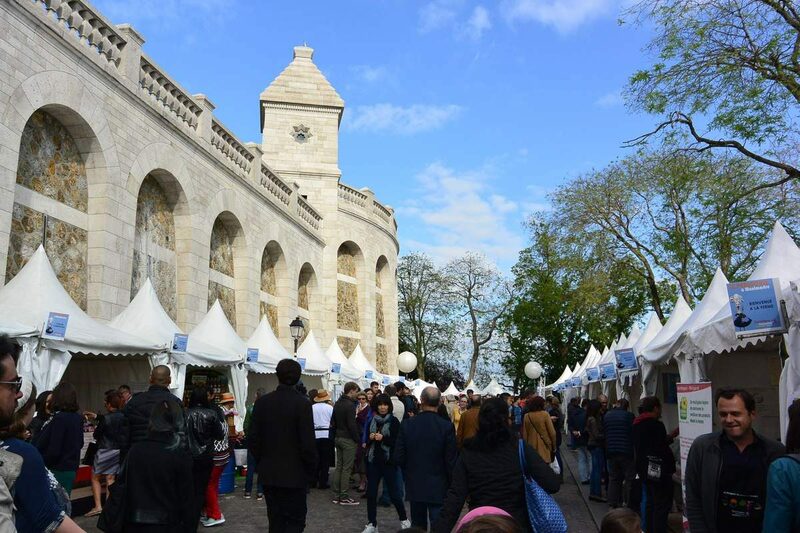 A lively farmer’s market filling the narrow streets around Sacre-Coeur offer booths selling local products – honey, escargots, strawberry wine, beer, and chorizo. Wait, are we in France or Spain? 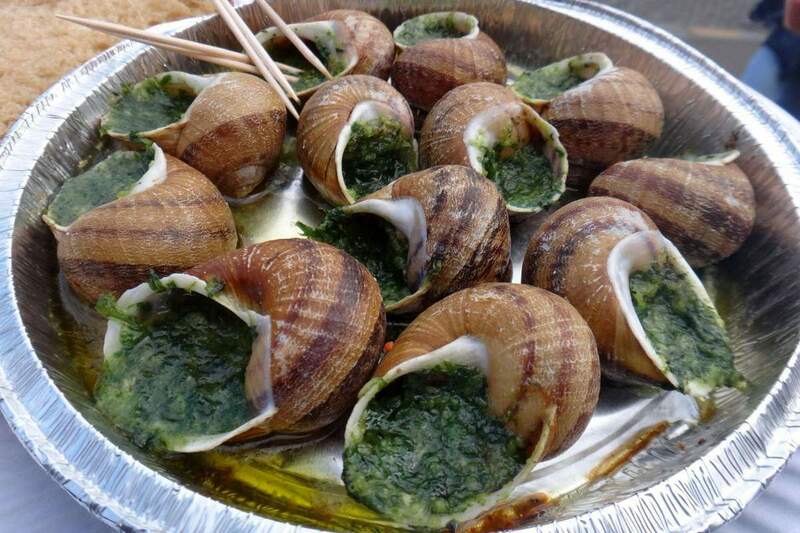 Our friends, Khoa & Bailey, had arrived in Paris a day before us and had already sampled the famous little gastropods. My notion that escargots were an expensive delicacy served only at the most expensive restaurants were quickly dispelled. We’d already seen them listed on sidewalk menus and advertised at inexpensive cafes, but a person can only eat so much in one day! Bailey was pretty confident we’d have our chance to try them at the farmer’s market. We just had to get the guys past the beer booth. 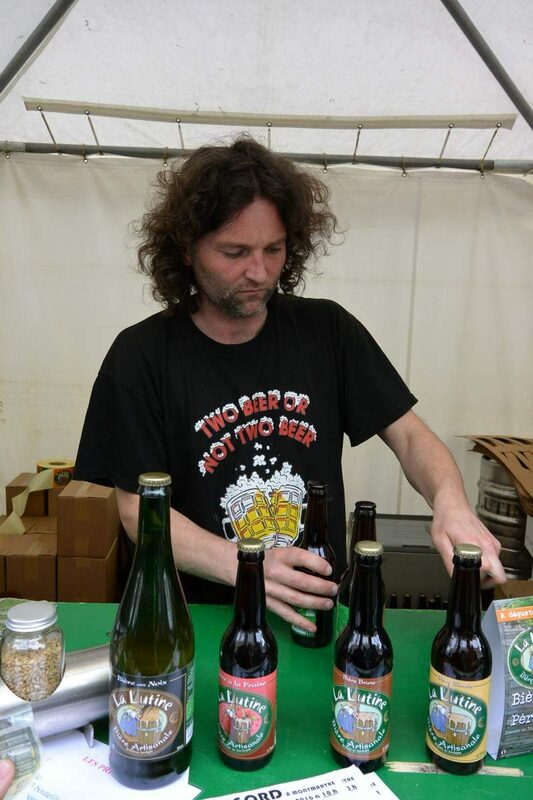 Two Beer Or Not Two Beer – that is the question. And the ladies past the wine booth, after buying some, of course. The alcohol content in this bottle of local strawberry wine might be only around 3%, but it’s still delicious – like drinking summer itself. As Bailey had predicted, we found a vendor at the market selling escargots. 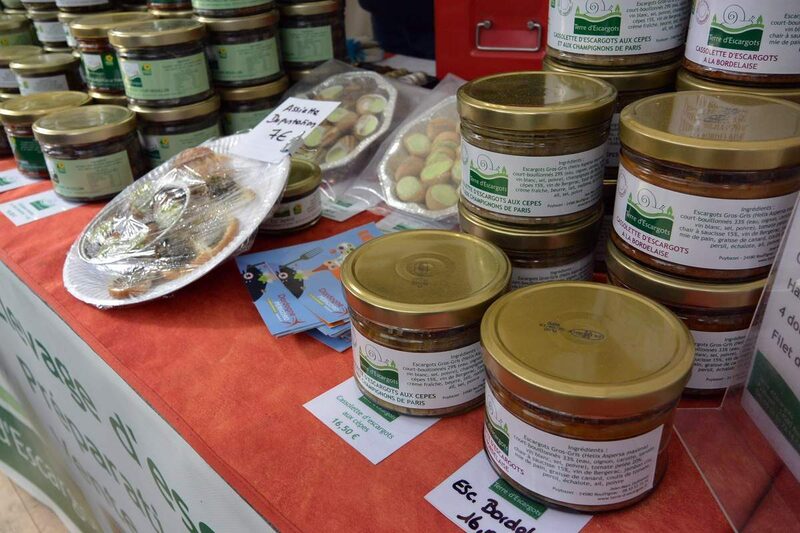 The booth represented L’Escargo du Périgord, a privately owned snail farm in Dordogne, a region in southern France. 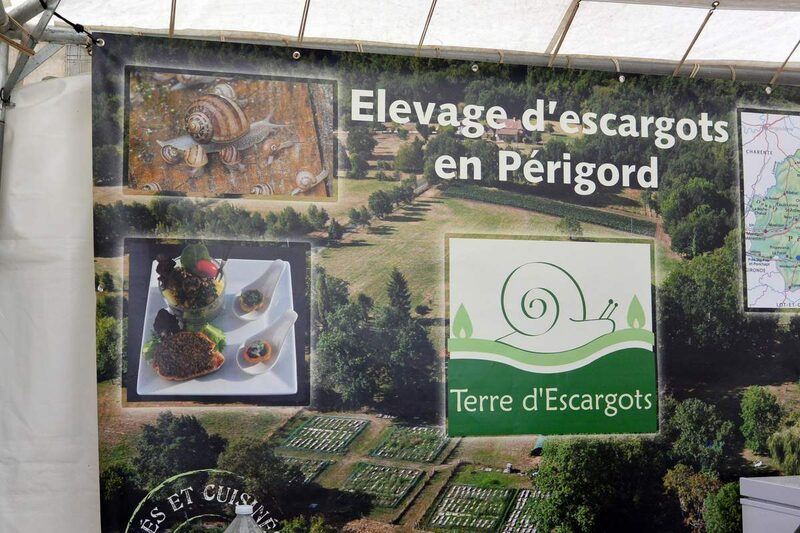 L’Escargot du Perigord is a snail farm in Dordogne, a southwestern region of France. Presumably, the older couple working in the booth were the owners themselves, Béatrice & Pierre Fouquet. Exceedingly friendly and smiling with appreciation at our excitement, they cooked up a batch of fresh snails for us while we waited, then moved on to help the next eager folks in a steady stream of customers. Compared to many of the other booths that seemed to be drawing little business, escargots were clearly bringing home the bacon. Here you can find escargots in every manner of sauce – spicy, bordelaise, or their local specialty with duck, bacon, and white wine. Carving out a space for the four of us on the steps of Sacre-Coeur, Travis and I stared in anticipation at our plateful of escargots. The smell was incredible. Drenched in garlic butter and parsley, we could have been eating any kind of meat had it not been for the shell. Dislodging the first oversized critter from his home with a tooth pick, I popped it in my mouth, surprised to find it savory and chewy, not slimy or mushy. It was not at all what I expected. It certainly does not taste like chicken. It’s better! A platter of 12 large escargots costs 7 euros. While the four of us munched on our tasty little nuggets of snail flesh, we watched a fascinating array of French styles parade past – an impressive variety of ankle boots, a whole lotta animal print, and my favorite – a gal in a waist-length Zorro cape, gaucho hat, and short-shorts – all black. We lounged away the better part of the evening this way – drinking, eating, and admiring the views of Paris and Sacre-Coeur. We couldn’t stop laughing at the disgusted looks our escargots received from a group of young school kids milling about. 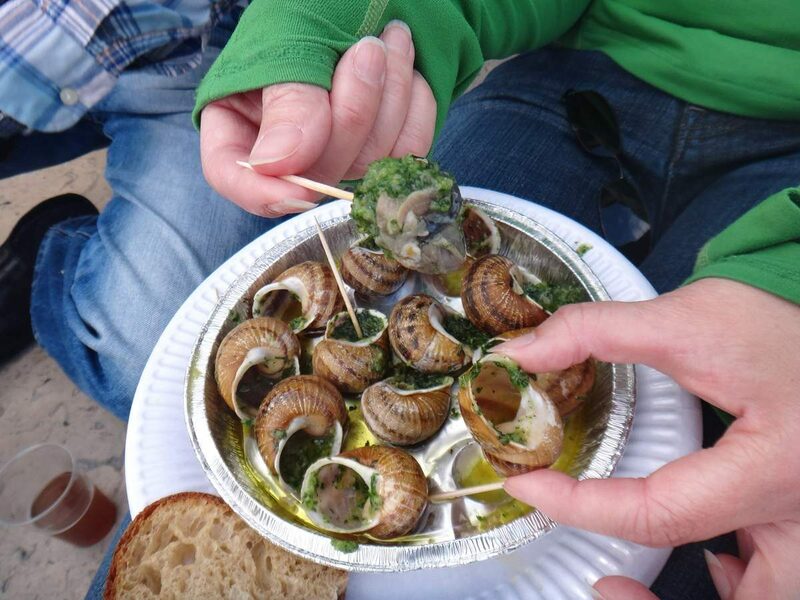 Surely escargots aren’t only for tourists? 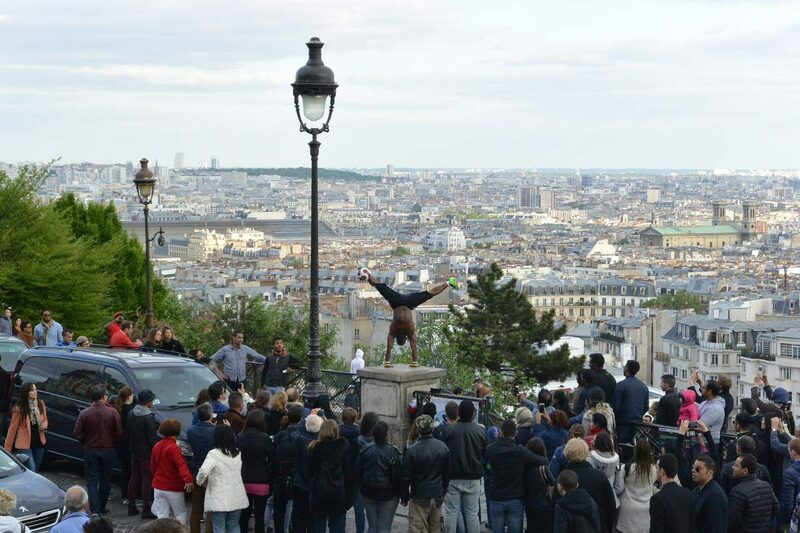 Doing hand-stands and hanging from a light fixture, a soccer player performs tricks for a crowd in the streets below Sacre-Coeur. From below, the dome of Sacre-Coeur glows white-gold in the setting sun on top of Montmartre. From Sacre-Coeur, we descended Montmartre and made our way toward the iconic Moulin Rouge, unknowingly entering the heart of Pigalle, Paris’s red-light district. As we neared the bright red windmill rising up behind the building, we paused to let a gal with three adorable ponies pass in front of us, watching in surprise as she led them into the famous cabaret. 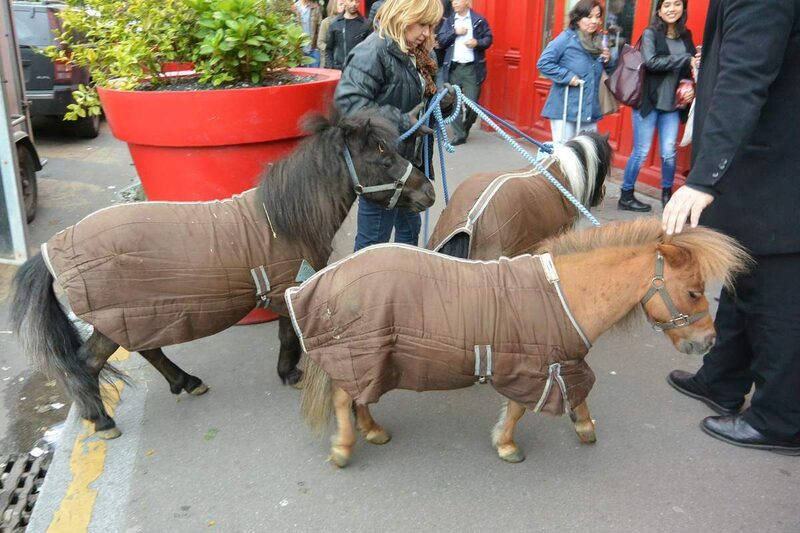 Just what does an audition for the Moulin Rouge “entail” for a pony, anyway? Despite its seedy reputation, we were neither accosted nor did I feel unsafe. I rather liked the feel of the neighborhood – less touristy and more like everyday life in the city. 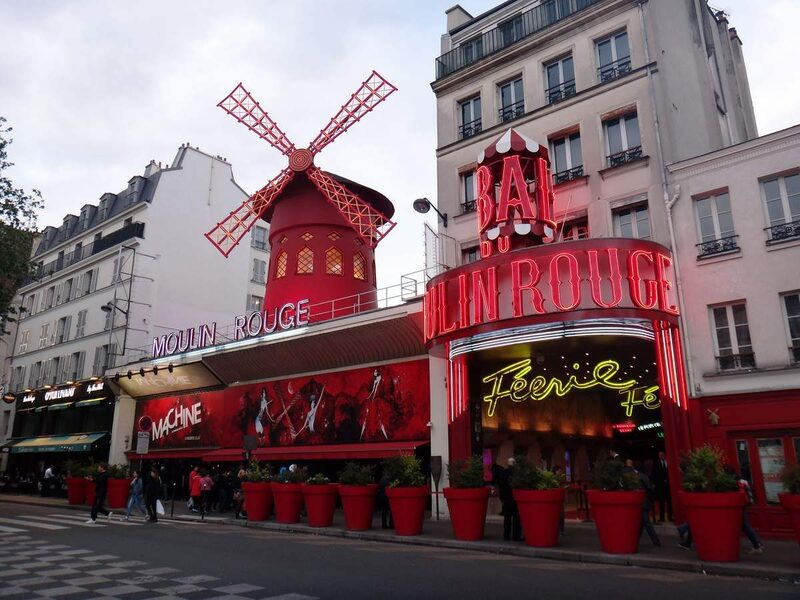 The original building from 1889 was destroyed in a fire in 1915, but the Moulin Rouge was quickly rebuilt and has undergone continuous renovations in its 125-year history. Since we hadn’t planned on even visiting the Moulin Rouge, let alone seeing a show, we hadn’t bought tickets. Khoa popped in to ask one of the bouncers if it was possible to enter the club just for a drink without seeing the show, but we were politely turned away. It didn’t take us long before we found a nice little bar nearby with heated outdoor seating, which is where we spent the remainder of the evening. Seeing a show at the Moulin Rouge is still on my bucket list, so we’ll make it happen next time we’re in Paris. We’ll definitely be back for more escargots. 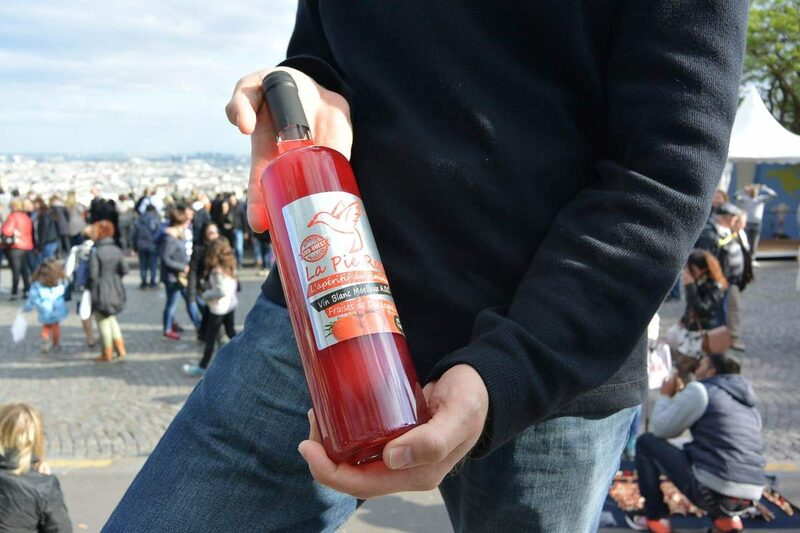 Headed to France? Like unusual lodging? You can book a room on the snail farm, L’Escargo du Perigord. Escargots don’t get any fresher than that! Entry to Sacre-Coeur is free. 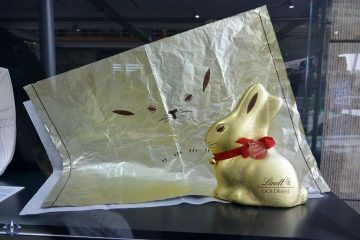 Imhoff Schokoladenmusuem: Chocolate, Git In Mah Belly!